Oratorio in 3 parts. Composed by George Frideric Handel (1685-1759). Edited by John Tobin and Max Schneider. This edition: Urtext edition. Paperback. 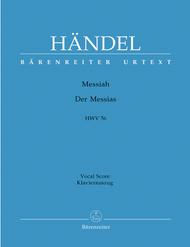 Barenreiter Urtext. Baroque, Sacred, Christmas and Easter. Vocal score. With Text language: German, English. HWV 56. 345 pages. Duration 2 hours, 40 minutes. Baerenreiter Verlag #BA04012-90. Published by Baerenreiter Verlag (BA.BA04012-90). ISBN 9790006442898. 7.5x10.5 inches. Language: German, English. Translation: Konrad Ameln. Text: Jennens, Charles. What I find missing and surprising for a B. ed. is the absence of a preface or any scholarly notation (aside from the typical recommended appoggiature). 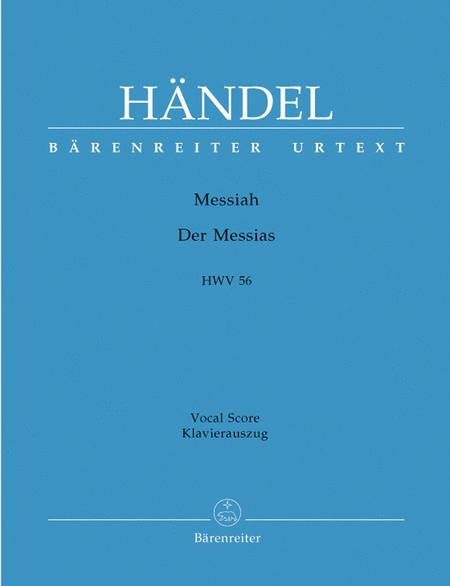 If you're singing a Messiah, I'd recommend other, more scholarly, and much lighter scores to hold in front of you.